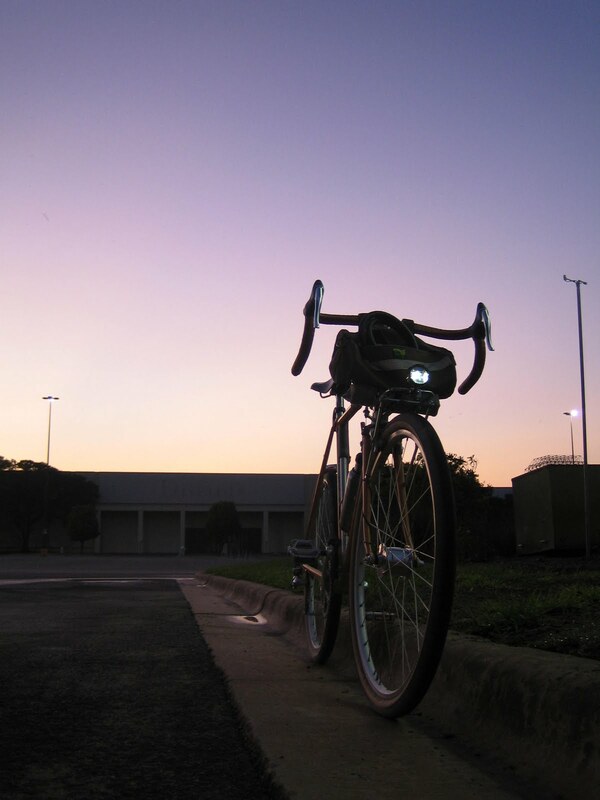 No where as nice as the lead photo on the recent Rat Trap Press post which inspired me, here’s photo documentation of an early morning ride. Besides the whole talent and skill advantage thing he has, I’ll excuse myself by saying I’m in Austin on business, and had a mall as my backdrop. I’m just thankful, that I was able to bring the bike and get a short ride in before reporting for duty. His post was more than photo inspiration, it was “make the effort” inspiration as well. For that, I am also thankful. Excellent. I applaud both of you for getting up so ridiculously early. It appears it was worth it. Golly, lately I've been getting up later, partly to help getting over a nasty summer cough. It is still nice, however. Just heard a NPR story this morning on the TX drought and heat and its effects on the cattle markets. Amazing, really. Hopefully it'll all break soon and you can stop being an Arab swathed in multiple white dressing gowns. 'course, you have the advantage of AC; I assume they don't. We are praying for rain, and offering profound thankgiving for AC.